So, where do these intersect? Let’s take a quick look. Speaking and facilitation seem to be at the heart of many things on my four lists. Teaching, coaching, consulting, selling—they all revolve around the ability to connect with others and have meaningful conversations. Of course, listening and analysis can be just as important to those conversations as the speaking parts! Now, bear in mind that these lists do have some similarities between them. That’s kind of the idea! If you’ve been paying any attention at all to my posts describing the facets of ikigai, the point is to find where those intersect. Once you know that, then you can focus on that intersection. How the heck does this mesh with “what the world needs,” though? Obviously, that list is largely based on my opinions. I feel that in this day and age, we are all too distracted, disorganized and frenetic. The problem with those things is that many people don’t see them as bad things, or, at least, not bad enough to take any kind of lasting action. How, then, can I use my talents in ways that are meaningful to me? It looks like I am going to have to roll up my sleeves, put on my “Hat o’ Patience” and attempt to find the folks who do care enough to try tackling those issues. Companies thrive on efficiency and tactics, and many of us are looking for the right reasons to really spur lasting, positive change. With that said, I intend to try an experiment. I will provide email coaching for five people over the course of three months on a pay-what-you-want model. This means you have no obligation to pay me anything if you don’t want to. I am truly looking to help people who are feeling stuck in a rut or tired of their job, or who are looking for an edge as they start a business or side hustle. This is first come, first served, so drop me a line at curious@protagonist.life if you want in! Spots will go quickly, so stop being frustrated and take action! There is literally no risk to you. 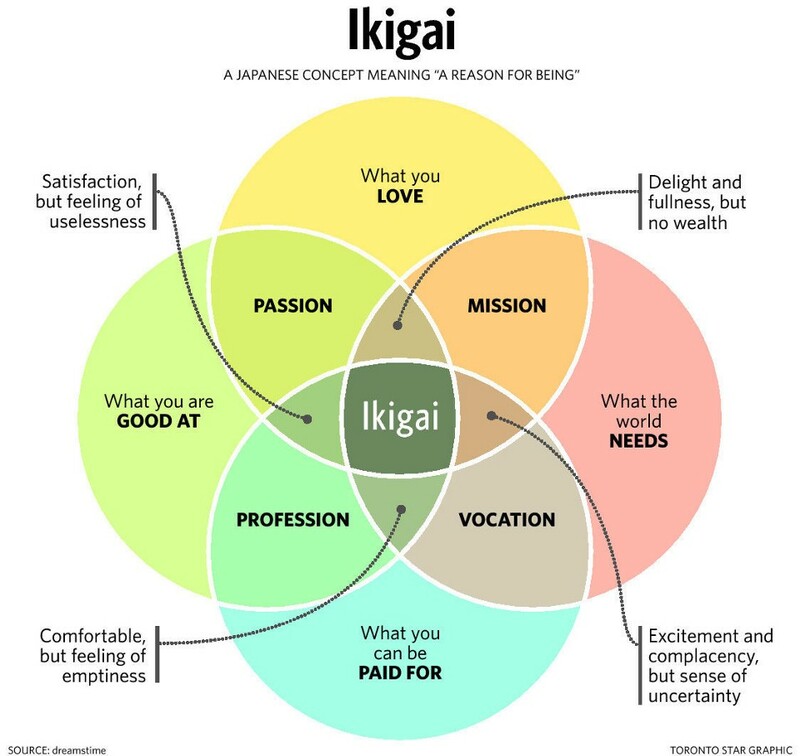 So far we have discussed three elements within the concept of Ikigai: what you are good at, what you love, and what the world needs. This time around, let’s take a look into the intersection of what you can be paid for and what the world needs: vocation. So, in some respects, my definition is not far off. In past posts I have mentioned the balance that must exist in order to realize one’s Ikigai. Just like the last two, this is part of the balance. Think of the balance here as less of a two-ended scale and more of a gyroscope. There are layers here that all play off of each other to keep your Ikigai stable and standing. How, then, does one find a vocation that meets the definition sought by Ikigai—something you can be paid for that the world really and truly needs? Again, it is a case by case situation. The world needs lots of things, and many of them are subtle. I want to reiterate that as grand as the phrase “what the world needs” sounds, it only has to be as grand as you desire to make it. Some people have the gumption to do something on a large scale, while many others only have the ability and desire to do small, specific things. How we do those things long term is the key when it comes to the vocation element. A quick story about my thoughts on vocation. Lately I have been spending time and effort to simplify my life. I’ve done away with all sorts of not only excess possessions, but also excess actions. Each week I have been paying attention to the things I like in my day to day life and job and each week I learn something small. Things about myself, mostly, that I feel are getting me closer to a vocation that I truly want to do. Oddly enough, signs continue to point me in the direction of the coaching and consulting that I am building Protagonist to provide. For example, I really enjoy working with people to solve problems. Speculating and making informed suggestions is something I enjoy and can provide as a service. Long story short, finding your Ikigai is not an overnight deal. It is very much a long-term investment and certainly one that will pay huge dividends. How would you go about finding your Ikigai? What methods would you employ? How close do you think you are? Every January, millions (if not billions) of people resolve to accomplish new goals. This is common knowledge for most and a bit of a joke for many, because people often set out with good intent and yet fail to reach their goals. We see images warning us that the “New Year’s resolutioners are coming,” as if they are some sort of plague or enemy army that we should be wary of. In my opinion, we should be less wary of others than of ourselves—and not only at New Year’s. A trend I notice with the people I have worked with and with people I generally encounter is that we, as individuals, tend to take the path of least resistance. It’s easier that way, right? Well…yes and no. It depends on what kind of time frame you are referencing, and what kind of quality of life you want from your results. The longer we take the path of least resistance, the farther we slide downhill. Look, I get it! We all have a million things going on, and taking the time to do everything to a higher standard regularly is not only taxing, it’s stressful. I’ve written on the virtues of simplicity and creating space before and I encourage you to go (re)read those, but instead of reiterating that idea in this post, I want to build on it. Why do I want to pursue this goal? – If the reason is superficial or circumstantial, I usually reconsider. Is it worth doing for a long time? – This means six months or more, consistently. I like this time frame as a benchmark because if you want to see lasting change, you need to dedicate the time to create that change. What am I willing to do (or not do) to accomplish this? – This is a big one! If you aren’t willing to go to lengths that are proportionate to your goal, then it probably is not worth pursuing. I am 100% confident you have what it takes to accomplish whatever you want—but you have to really want it! So many people get caught up in doing what is popular that they lose sight of what means the most to them. This time of year, half of your friends have probably decided to buy a gym membership and give regular exercise a go. Good for them! But is that course of action right for you? Maybe, maybe not—think about it first. Ask yourself those three questions, and then you will have a solid justification for choosing whether to attempt your resolution. You don’t need the permission of others to pursue your personal goals. You only need a reason that makes enough sense to you to follow through.